Lotus Traders Clothing is a company with almost 3 decades of experience, based in Indonesia (with factories in different Asian countries) specialized in bohemian and renaissance dresses, with a wide range of renaissance tops and chemises in many colours that can work wonders as undergarment or base to build up you fairy, goddess or even Steampunk fantasy costume. The store shows a large catalogue Boho, princess and Renaissance dresses made to order (S up to 5X), usually in Rayon Lycra and Light weight Rayon and shipped world wide (with a few exclusions) from Indonesia. Unfortunately, the only complaint I might have that have restrained me from purchasing is the shipping cost to my country (I'm based in Spain), so It's worth to check if there are resellers of the brand in your area. They have plenty of listings in ebay too. I like that they have a wide range of colours and sometimes not the usual ones like teal, silver grey, purples and fire reds and oranges. Bold and vivid but not cheesy looking. I particularly enjoy their shades of green (moss, khaki and Olive) and brown, as they seem very earthy. But they don't only list solid colours but also print dresses in some models. Some of the garments are "batiked which involves completely handmade process and because of this there are natural variations in colours and tones, as well as pattern placements, from meter to meter. Because of this you are guaranteed a unique piece as no two garments are alike. It's pretty obvious that many of the models are made to enhance the shape and flatter curvy ladies (like me), but they make smaller sizes as well. You can find sleeveless models as well as gorgeous almost medieval fluted sleeves. 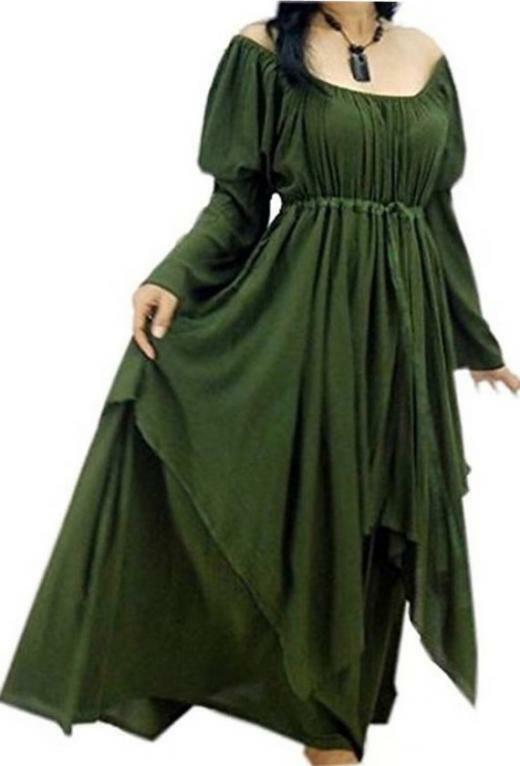 Below, examples of long dresses /chemises, perfect for renaissance or wench/fantasy/pirate style. They also feature a vast collection of asymmetrical, handkerchief and bohemian clothing, perfect for urban pixie. Some similar to psy clothing. Speedy stitches: From Oz to Star Wars... a collection of classical characters!